Natural stone, such as, marble, granite, slate, travertine, and limestone, are all gorgeous choices when looking at flooring for your home. However, the problem with these stunning natural stones is how vulnerable they are to damage. 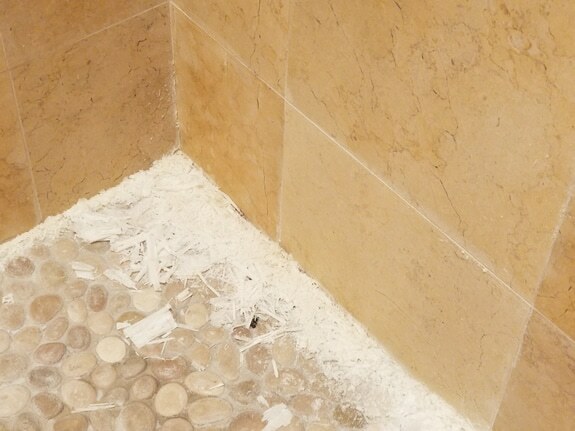 Primarily, the damage that afflicts natural stone comes in the form of staining and etching. What makes natural stone so much more susceptible to staining than other materials, is the fact that it is made of porous materials. This means they are made of very many holes, like underground hollowed out tunnels leading from one side of the stone to another. This makes them similar to a sponge but made out of a harder substance. So, like a sponge, these stones are quick to absorb liquids, trapping the liquids within the tunnels below the surface. This can be very problematic for a lightly colored stone and say, a glass of red wine. should be sealed annually. If the stone flooring is in a high traffic area, or if you are in a household with active children or pets, your stone flooring may require more frequent sealing in order to protect it. If you are unsure if your natural stone seal is in need of being redone, there is a simple test you can do at home in order to check. Take a glass of water to the area you are wanting to inquire about, sticking your fingers in the water and spread droplets of water on your stone. Check back in an hour and see if the water has penetrated the stone or if it is still bubbled up. If the water is gone, and you do not see a wet spot in its place, this may just mean the water has evaporated. If you see a darkened wet spot on your stone, your floors are in need of a seal. While prevention is always the best way to avoid staining, it is not always an option. The natural stone experts at Modern Stone Care are experienced in restoring mistreated and stained stone flooring. Contact us today if you are looking to lift a stain or restore your natural stone flooring.